I did this just for fun. Just wanted to try to see if I added liquer into the whipping cream..what happens to it..surprisingly, it breaks down the crystalisation of water/ice and made the ice cream extra smooth and creamier than all the others I have done recently. 1. Add cream, sugar, and cocoa powder to whip at high speed for 3mins. 2. When its creamy or soft peaks, add the liquer to whip for 30 secs on high speed just to mix it evenly. 3. Pour the contents into a container and cover it for freezing. 4. 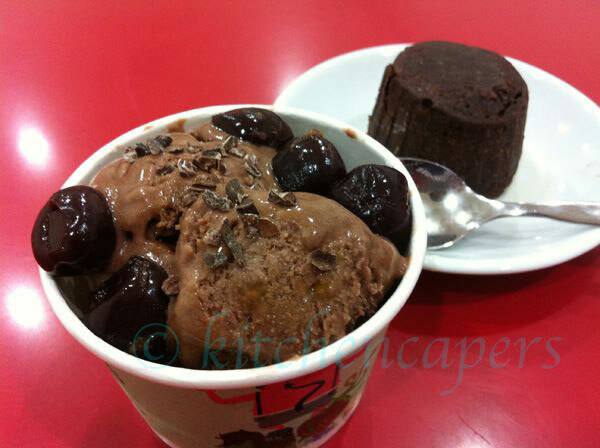 Freeze overnight..serve with dark sweet cherries or with a good chocolate cake..yums! Gina, if we're using the Amaretto Gel, it's also 3 tbsp? If use the gel, only 1.5 tbsp..its super strong..!